Dimensions 0.30 by 6 by 9 in. Amazon.com description: Product Description: While going through the possessions of a deceased guest who owed them money, the mistress of the inn and her son find a treasure map that leads them to a pirate's fortune. 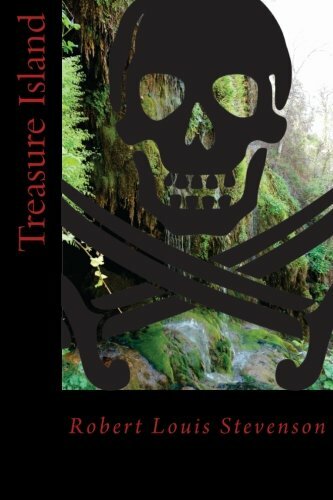 Treasure Island is the thrilling tale of "buccaneers and buried gold." Traditionally considered a coming of age story, it is an adventure tale of fascinating atmosphere, character and action, and also a wry commentary on the ambiguity of morality; as seen in Long John Silver. About: Step inside the world of the talented art departments who, led by Academy Award®-winning production designer Stuart Craig, were responsible for the creation of the unforgettable characters, locations and beasts from the eagerly anticipated new adventure in J. About: Return to the wizarding world and discover how director David Yates and producer David Heyman brought J. About: Take a front-row seat and witness the filmmaking magic that brought J.
from Classic Comic Store Ltd (January 19, 2016); titled "Classics Illustrated: Treasure Island"
About: Stevenson's tale of young Jim Hawkins, aboard the ship, Hispaniola, and the devious ship's cook turned pirate, Long John Silver in his hunt for hidden treasure. About: One of a series of top-quality fiction for schools, this is Robert Louis Stevenson's classic adventure story. About: Color your way on a magical adventure as you step onto the streets of New York in 1926, and meet Newt Scamander and his beasts! About: Showcasing artwork from both Fantastic Beasts and Where to Find Them: Magical Characters & Places and Fantastic Beasts and Where to Find Them: Magical Creatures Coloring Books, this collection of 20 postcards is filled with intricate illustrations and dazzling designs from the film. About: • Treasure Island is an enduring adventure tale for all time and one of the most frequently dramatized of all novels• A defining work of its genre• A swashbuckling coming-of-age story of pirates, sea battles, and a quest for buried treasureWhen an old sea captain passes away while staying at his mother’s inn, young Jim Hawkins has no idea what lies in store just across the horizon. About: Robert Louis Stevenson’s rousing seafaring classic. About: A masterful tale of ''buccaneers and buried gold''. About: BEFORE JACK SPARROW THERE WAS LONG JOHN SILVER Young Jim Hawkins is drawn into an amazing adventure on the High Seas, which takes him aboard the Hispaniola in search of pirate treasure. About: Why buy our paperbacks? About: Treasure Island is an adventure novel by Scottish author Robert Louis Stevenson, narrating a tale of "buccaneers and buried gold". About: Treasure Island is an adventure novel by Scottish author Robert Louis Stevenson, narrating a tale of ”buccaneers and buried gold”. About: Treasure Island is traditionally considered a coming-of-age story, and is noted for its atmosphere, characters, and action. About: HOME TITLES GENRES AUTHORS LANGUAGES NEW TITLES RECOMMENDED POPULAR Treasure Island Cover image for Download download author: Robert Louis Stevenson published: 1883 language: English wordcount: 68,021 / 182 pg flesch-kincaid reading ease: 87. About: Jim Hawkins has led an ordinary life as an innkeeper’s son until the day he inadvertently discovers a treasure map in a trunk belonging to an old sea captain, and thus, suddenly, his ordinary life turns into the extraordinary adventure of a lifetime. About: Description Notice: This Book is published by Historical Books Limited (www. About: While going through the possessions of a deceased guest who owed them money, the mistress of the inn and her son find a treasure map that leads them to a pirate's fortune. About: Thank you for checking out this children's classic by Guga Books. Large print edition from Createspace Independent Pub (February 16, 2014); titled "Treasure Island: The Complete & Unabridged Classic Edition"
About: This premium quality large print edition includes the complete unabridged text of Robert Louis Stevenson's classic tale of "buccaneers and buried treasure" in a freshly edited and newly typeset edition. About: Classics with legible texts you can actually read at a fantastic price. About: Treasure Island is an adventure novel written by Robert Louis Stevenson about pirates and hidden gold. About: A young boy, Jim Hawkins, lives quietly by the sea with his mother and father until Billy Bones comes to live with them.